It had to happen. With any old tablet and any old Bluetooth keyboard you can create a perfectly good mobile office, but poor sales mean that tablets are now all and only about branding. 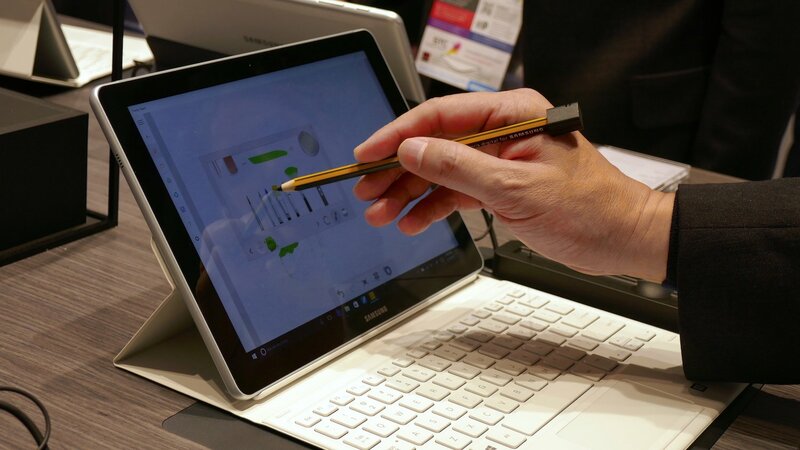 Cue Samsung’s customised attempt to create an alternative to the Microsoft Surface Pro 4 & the iPad Pro. Coming in two shapes – 12-inch and 10.4-inch – the Samsung Galaxy Book runs on a Windows 10 OS. Both models are bundled with the Keyboard Cover and Samsung’s new S Pen, so there’s no confusion as to who they are aimed at. Is it worth it? Initial reaction is no; this is just a boring Windows tablet and a separate keyboard cover – and not much different to the brand’s Galaxy Tab Pro S tablet. The cover adds a prop stand, and it’s soft, well designed and seemed reasonably effective for typing in our test. All iterations of the Samsung Galaxy Book will ship with an Intel Core i5-7200U processor, but you will be able to spec either 4GB or 8GB memory, and 128GB or 256GB storage capacity. Or you could just buy a decent portable keyboard for the tablet you already have … and who needs a stylus, anyway?